The amount of charitable contributions made through online donations has been growing steadily for years. Furthermore, because it is the preferred giving method of millennials, online fundraising will only become more important in years to come. To maximize revenue, you should look closely at the process by which someone discovers your organization online and becomes a donor. This process is quite similar to the sales funnel used by software as a service (SAAS) companies like Classy. Learn to optimize each level of the giving funnel, and you can increase donations and nurture website traffic into lifelong supporters. To help your nonprofit improve its donor cultivation funnel, we’ve broken down the stages below and included tips to optimize each one. The reason marketers refer to the process of nurturing prospects into donors or customers as a funnel is that the first stage includes the biggest audience. Each subsequent part of the process narrows this pool of people. For instance, you might get 10,000 visitors to your website in a month, but only a fraction of them will convert into email subscribers and only a fraction of those people will make a donation. Increase the number of people entering the funnel. Increase the percentage of people who convert from one stage to the next. or increase the percentage that convert into subscribers. Read on for tips to increase the number of people entering the funnel and ways to increase conversion rates at each stage. 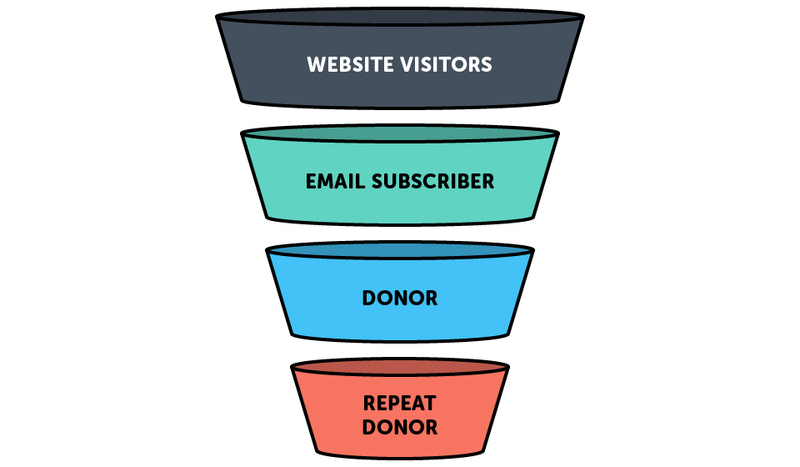 For nonprofits who want to grow their new online donors, the funnel begins with website visitors. While this is the most passive stage of the donation funnel, it also defines what you can do at every other stage. The more website visitors you attract, the more people you can potentially convert into email subscribers, and eventually, donors. At this level, your audience may be entirely unfamiliar with your cause or organization. That means your goal is to increase awareness, educate, and entice people to submit their email addresses, usually by offering some kind of content or other value. Optimize for SEO. The more searchable your website and content, the more likely people will find it when they search terms relevant to you cause. Make a splash on social media. Post useful and interesting content that delights your followers and induces them to share. Include CTAs and links to your website. You can pay to promote posts on social media, but you should also take advantage of Google Ad Grants, which offers nonprofits up to $10,000 in free advertising each month. Include eye-catching CTAs on your website that ask visitors to subscribe or submit their email addresses. Test different color, copy, and placement to optimize your CTAs. Offer valuable content to visitors. This could be the regular updates or newsletters that you already send out. You can also offer useful information or interesting impact stories to visitors. The next step toward becoming a donor is to submit an email address. Many people will not donate the first time they encounter your organization, but if they submit their email addresses, you can continue the conversation and eventually guide them to deeper levels of support. At this level of the funnel, your audience has taken some action to opt in to your communications. Although this person has some familiarity with your cause or organization, they probably don’t know a lot of details. Your goal, then, is to educate this audience on your work, build trust, and tell a great story. This nurturing will help you convert email contacts into donors. Build trust and familiarity through a welcome email series. Make your communications beautiful, to the point, and fun. Tell compelling stories about individuals affected by your cause and programs. Include links to your website and blog, along with donation CTAs. Following your welcome series, keep your email list updated with your active fundraising campaigns. Pro Tip: Use A/B testing to optimize your emails. Test new subject lines, design elements, and CTAs to see what results in the highest click-through rates and conversion rates. Now things are getting exciting. The people who reach this level of the funnel are not only familiar and interested in your cause, but they have also taken concrete steps to help you make change. But what you do at this stage can either help your fundraising grow and thrive, or it can force you to constantly start over. Your goal now is donor retention and converting people into recurring givers. The first and most important step to retain donors is to thank them and thank them well. Remember that an automated donation receipt is not a thank you. Update donors and show the impact their gift is making. Give them the opportunity to give again by keeping them updated on new campaigns. Promote your recurring giving program. Invite them to become a part of this special group of supporters. Now that you have guided your donors through this process, the smartest thing you can do is hold onto them. Continue to nurture and appreciate your supporters with periodic thank yous and delightful impact stories and updates. Notify recurring donors when their credit cards are about to expire and send them a link to update it. Segment monthly donors and create email updates and appeals tailor-made for them. At year’s end or on their monthly giving anniversary, ask them to upgrade their gift. And remember, it’s always a good time to say thank you to your donors. Consistent communication and appreciation will keep your bond with them strong.